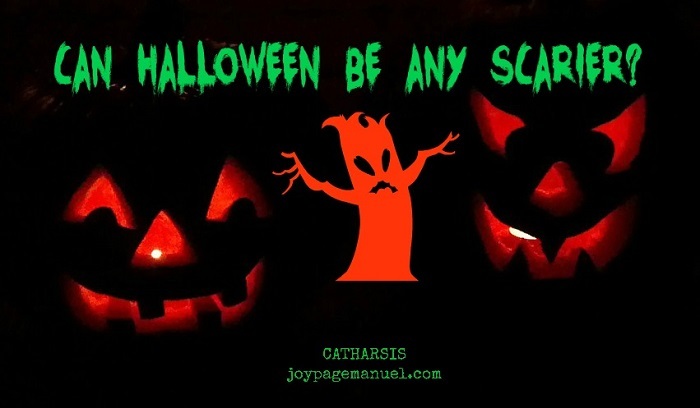 CATHARSIS: Can Halloween Be Any Scarier? I knew seeing a police man stationed close to the entrance of the store was not a good sign. At first we thought there must have been a commotion inside. As soon as we swung the doors open though and stepped in, and seeing that the cop was trying to be as unobtrusive as possible yet still visible, I figured he was just there as a deterrent. It is the last weekend before Halloween after all and things can get a little crazy at costume and party stores. Actually, crazy is a pretty accurate word to sum this all up. When we got to the 'wall of fear', it was packed. What's the wall of fear, you may ask? It's the store's wall displaying pictures of all the children's costumes they're selling, from which kids and parents select their costume of choice and take note of the merchandise code so that a sales attendant can grab the package for you from the back storage room. It's not the costumes that I find scary. It's the prices! Costumes to be worn once, all averaging $30 a piece—that's scary. And crazy! Then the line for fitting was also crazy. If my son didn't bother with a first and second option, I would've insisted not bothering to fit. After 11 years of living here in the U.S., I can finally say that I'm now comfortable with the idea of returning merchandise when absolutely necessary. (It's crazy too that it's taken me that long). When we finally made it to the fitting 'room', I realized that you can hardly call it a room because it was more like a box. Stepping in there with a child and unpacking costumes with a million components inside the packages was hell! There was nowhere to rest anything on and things just kept falling to the ground which meant you'd have to pick them up. But have you tried bending over in a 3' x 4' space while with another person in it? After 10 minutes, I just wanted to scream and knew I've had enough. If I spent another five minutes in that store, I would've ended up attacking everyone with the overpriced ninja swords laying around before I committed harakiri! Can you really blame me if I'm not a big fan of Halloween? To me it embodies the height of capitalism with businesses taking advantage of people's desire to participate in a tradition. It's mostly about profit and commercialism. It's not even a real holiday! I grew up in the Philippines and we celebrated All Saints' Day and All Souls' Day. People went to the cemetery to visit loved ones who have passed. Families gathered and prayed. There were no costumes and candies and expensive decorations. I think only those who lived in exclusive, gated subdivisions participated in that but only minimally. At least up until I left the Philippines 11 years ago, Halloween was never celebrated to the extent that I see here in the U.S. I'm sure the children have fun. I'm sure the children pressure their parents to give in and the parents (like myself) feel powerless because no one wants their child to feel left out. Adults and children alike don elaborate costumes for one night for the thrill and fun of it. Are we really that desperate to escape from reality and be something else for a few hours even when it means spending unwisely? Or maybe the costumes allow us to be more of who we think we are or who we authentically are deep down? That we need one designated day a year for that and have to spend money on costumes to accomplish something so important is a really scary, crazy thing, if that were the case. One thing is certain. Even though as Americans, we're really not celebrating anything significant on Halloween, businesses will continue to have a lot to celebrate with this 'holiday', that's for sure. I have never been a huge fan of it either. I don't have to deal with it anymore since we live on a dead end street and don't have nay kids, but I'm sure once the grandbabies get older I will be out there trick or treating once again.